UNIONDALE, N.Y. -- One year after John Tavares became a New York Islander at the NHL Entry Draft in Montreal, he joined teammates Matt Moulson and Trevor Gillies at the Nassau Coliseum in greeting the 2,000 fans who turned out Friday night to see the Isles make the fifth selection in this year's draft. Tavares, Moulson and Gillies modeled the Isles' new road jerseys and mingled with fans – many of whom undoubtedly were on hand last year to cheer the selection of Tavares with the No. 1 overall pick. Though the Isles weren't involved, the "Taylor vs. Tyler" question – whether the Edmonton Oilers would take Taylor Hall or Tyler Seguin with the No. 1 pick – still dominated the conversation. 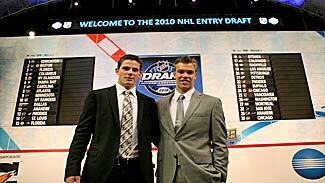 The Oilers ultimately took Hall, and Tavares – who played against him in junior hockey, said he is "dynamic offensively." Tavares also thinks that Hall won't take long to become a top player. "He has that ability to raise his game when it matters most. He loves to score goals, he creates offense and he's a great skater," Tavares told NHL.com. "At this level, I think if you can really skate well and play the way he does with that great knack for the net, he's going to have a great career. He's a great player and deserves to be number one." Tavares knows all about the pressure of being the No. 1 pick. "There's obviously a lot of expectations and a lot that comes with it, but guys like him have been trained for it," he said. Tavares also offered Hall some advice heading into his first season: "Get your rest, come into camp with a great attitude, come humble, but always be open to the guys who are ready to help and want to make you feel comfortable and help make the adjustment."